Ligers and tigons are both hybrid big cats. Tigons are produced when a male tiger breeds with a female lion. Ligers are the offspring of a male lion bred with a female tiger. Although they both result from a tiger and lion crossbreed, their specific parentage is what differentiates ligers from tigons. Ligers are bigger than tigons. They have both muted spots and stripes. They are tawny-orange in color, and the males have short manes. Both males and females have stripes on their backs and spots on their bellies. Ligers weigh on average 1,000 pounds, and the heaviest liger on record was 1,600 pounds. Ligers are considered the biggest cat on earth because tigers weigh about 500 pounds and lions max out at about 600 pounds. Ligers can make lion and tiger vocalizations. Ligers enjoy swimming, which is a tiger-like behavior. They're also social cats, which is a strictly lion-like trait. Tigons are a much more rare hybrid animal than ligers. Tigons more closely resemble their tiger fathers than ligers do their tiger mothers. Tigons have spots and stripes and are usually deep orange in color with white bellies. They can produce lion roars and tiger growls. Tigons are much smaller than ligers so are less popular in the world of hybrid fanciers. Tigons are not only smaller than ligers, they're often smaller than both their parents. Tigons also show a mix of lion- and tiger-like behaviors. They also enjoy both swimming and socializing. Ligers and tigons are created through humans' intentional mating of lions and tigers, or because the parent animals were housed together in human-controlled enclosures. Most tigon offspring don't reach full term or are stillborn because the mother tiger's womb isn't big enough to hold the big tigon cubs, which are larger than what the male tiger's cubs would be. Tigons are often smaller when full-grown than either of their parents. Big cat experts surmise that lions and tigers are able to breed because they're genetically similar enough that their chromosomes can pair and produce offspring. Both lions and tigers have 38 chromosomes. The ability of two separate species -- lions and tigers -- to produce offspring raises questions about just what defines a "species." Generally the term species refers to a group of genetically similar animals that can successfully produce offspring. However the word "successfully" is a sticking point when it comes to ligers and tigons -- many of these hybrid animals have genetic disorders and die at an unnaturally young age. Because of this, scientists believe it's safe to say that lions and tigers are clearly two different species that would not breed in the wild even if given the opportunity. Because female ligers and tigons have proven to be fertile in some cases, handlers have bred them with lions and tigers. These pairings have also happened accidentally when a ligeress or tigoness was housed with a lion or tiger. For instance, a tigoness that mates with a tiger produces titiger cubs. 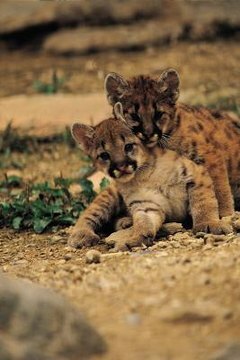 These cubs, with 75 percent tiger parentage, mostly resemble tigers with few lion-like attributes. Lions and tigers have also been bred with other big cat species, such as jaguars and leopards. Leopards and lions have been bred together to create leopons and lipards. A tiger-leopard pairing is called a tigard.